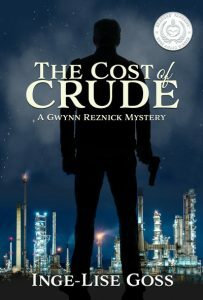 My muse kept nagging me to write a novel using my twenty-plus-years experience of auditing oil and gas companies. I decided to give it a shot, and from there the characters took over and corruption, betrayal, murder, romance, and a deadly conspiracy emerged. The main character flowed into my head during a dream. All of the other characters just appeared as the story evolved. Gwynn awoke slowly with tape covering her mouth again, her wrists firmly tied together, and her body aching. She saw the back of a man dressed in a Wilton security guard uniform sitting a few feet from her. Glancing down, she saw she was lying on a cot and her blouse had been torn, the rose pin gone. She managed to move her forearms over her bra and found the bug was also missing. The bandage, concealing the gps, was still securely attached to her arm. With her hands and mouth bound, she couldn’t activate it. She smelled a musty odor and wondered where they had taken her. Looking around, she saw a high ceiling with rusty metal trusses, several broken insect-infested skylights, and walls covered with masonry and metal siding. Pigeons fluttered around in the large open space; their droppings marked the walls. Old abandoned equipment stood in the center of the room, puddles of water on the cement floor. Off in the distance, she saw large double doors standing ajar with daylight shining through the opening.